PlayStation VR will have a motion-controlled gun controller, in addition to working with the PS Move. Designed specifically for VR and sporting a Move-esque blue orb, the PSVR Aim Controller is said to have 1-to-1 tracking for in-game weapons control. Based on Sony's promotional imagery, it appears all the standard DualShock 4 controls are present, with the rifle-style grip simply placing the handles and buttons in front of each other, as opposed to side by side. The only control missing is the right stick, which in most cases would be replaced by VR head and controller tracking anyway. 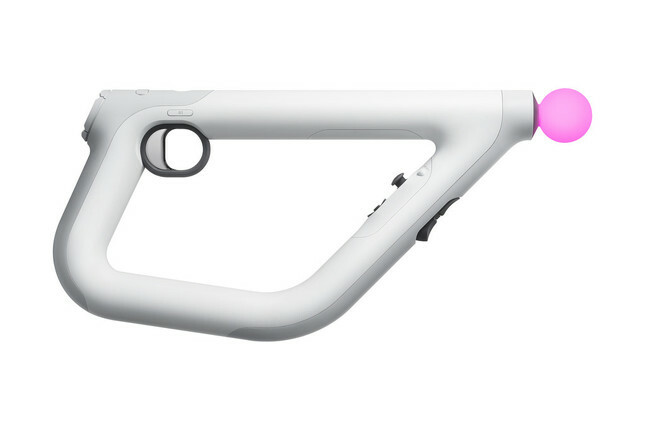 Sony designed the Aim Controller in conjunction with San Francisco-based Impulse Gear, using the studio's Farpoint as a launchpad. "How you hold and where you point the controller are directly matched in the game," wrote Impulse Gear on the PlayStation blog, claiming the controller "allows you to do things in Farpoint that just are not possible in a standard FPS game." Availability details have not been announced.